Moves for Seniors is making moving and downsizing easier than ever with Move-Now-Pay-Later financing. Now, new residents moving into senior housing communities can finance all or part of their move, keep cash flow going and ensure a stress-free transition into their new home. Whether you need items shipped, downsizing assistance, or a full household move, Moves for Seniors works with you to simplify every aspect of your move — and financing is just another way we do that. Move-Now-Pay-Later financing gives you the freedom to spend as much or as little on your move based on your approved loan by our finance partner. Even if your credit is less than perfect, we will work with you to help pay for the move with our financing options. You can apply for financing online. The simple application process can take less than 90 seconds. Call 1-800-227-0515 and we will gladly provide assistance. Once approved, you’ll immediately be presented with an account number and loan agreement. Use this account number to pay for your service. Schedule your move or shipment with Moves for Seniors using your account number just like a credit card. 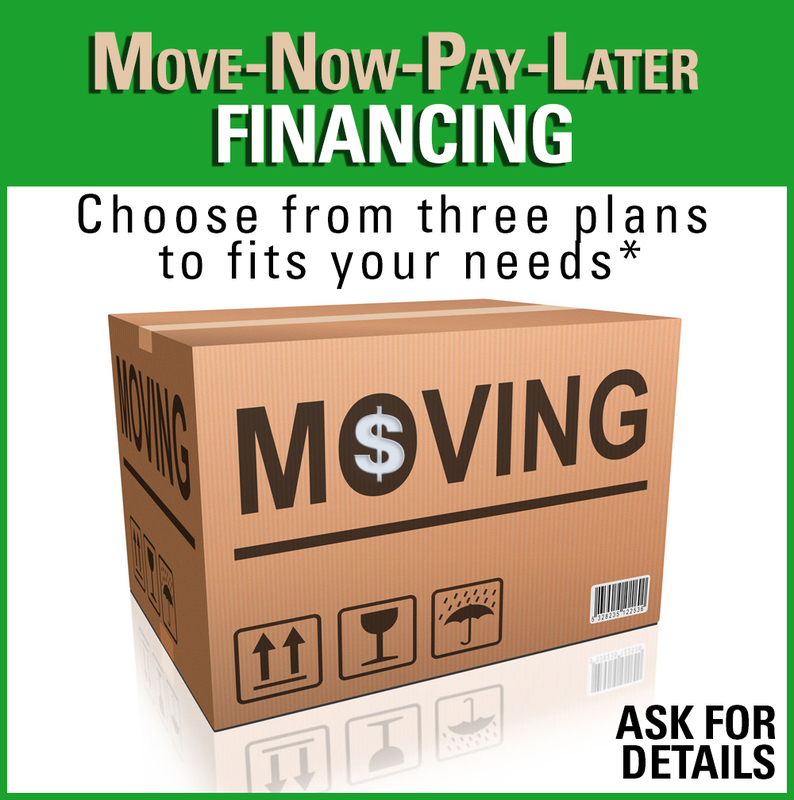 Let us handle your move related needs and you can pay the services off over time with Move-Now-Pay-Later financing. We are ready to help you make a smooth, stress-free transition into your new home. Please fill out form for more information about financing your move. Moves for Seniors’ number on goal is to make sure your move is a happy experience. We are the nationwide leader in Senior moving services and ready to help you make a smooth transition into your new home. From downsizing, donating, disposal, storage, and moving, you can take advantage of our expertise to make sure your move into your new home is as stress free as possible. Our Senior Move Specialists will guide you along the way and provide a comprehensive assessment of your needs and manage all moving logistics. Our experienced movers are licensed, vetted and fully insured for local or long distance moves. We also offer move financing for residents moving into senior housing communities to keep cash flow going and ensure a stress-free transition into their new home. * Financing is subject to credit approval. Ask for details. Fill out the form on this page or call Moves for Seniors at 1-800-227-0515.